You'll find just about everything you need at our Ship's Store. We're stocked with fishing supplies and boating supplies, not to mention plenty of food and drink! From bait to wakeboards, we've got you covered. You'll find tubes, ski ropes, sunglasses, t-shirts, ski ropes and much more. Grab a hot dog, a snack or one of our famous Slushies while you're here, too. We also offer a wide variety of services including mechanic services, detail services and canvas services. Contact us today with any questions. We look forward to seeing you! The Fun-Map t-shirts have arrived in three nautical colors. 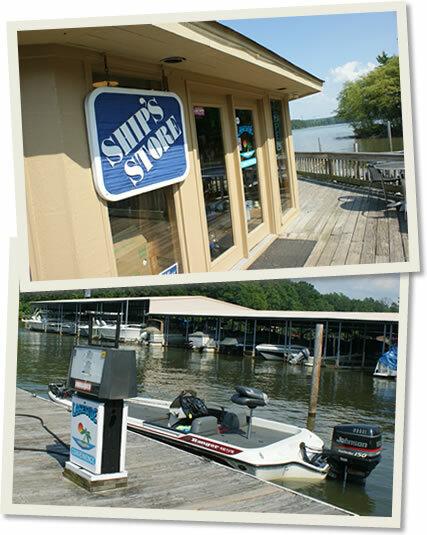 Check out the ships store to find out how we put fun on the map! We now have a few slips availible ranging from 10ft x 12ft, 14ft x 30ft, 12ft x 28ft, and 15ft x 30ft. Get one now before they're gone! © 2019 Harbortowne Marina and its licensors. All Rights Reserved.